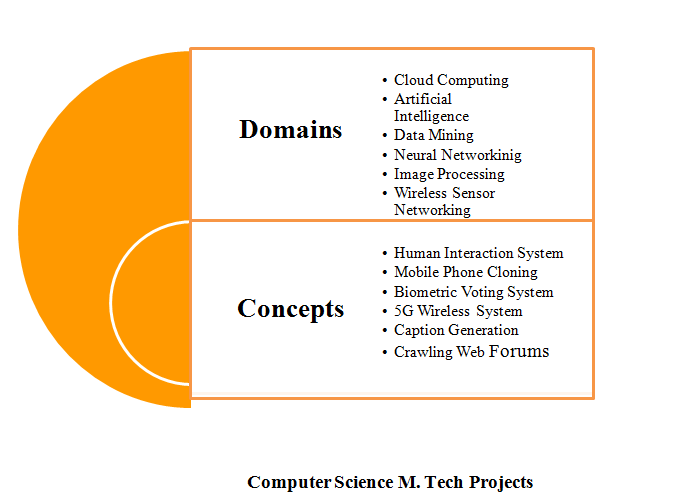 Computer Science MTech Projects we offer all domains like NETWORKING, DATA MINING, CLOUD COMPUTING, IMAGE PROCESSING etc. Computer science is a branch of engineering which deal with the understanding of computer applications, network formation, and computer components and data communication. Projects for students of M.TECH computer science should have more advanced algorithms. It usually focuses on domain such as high security of cloud computing, energy efficiency, multimedia applications, resource utilization, feature classification and networking. Other than these domains various other topics such as bio medical, cybernetics, mobile computing, distributed networking, grid computing and parallel networking also grab the attention of students. Projects of M.TECH should be advanced in every way from that of under graduate projects. M.TECH students have a wide range of domains to base their projects on they are namely data security, neural networking, wireless sensor network, cloud computing, image processing and artificial intelligence. Apart from this topic such as airborne internet, eye movement base human interaction system, mobile phone cloning, biometric voting system, 5G wireless system and mind reading computers are popular for M.TECH projects. These projects help students to gain knowledge on data representation, computer capabilities, and computer speed and memory size. Data’s received by computer is in the format of binary representation memory cells of a system can contain floating values, integers, floating values, character type and instructions. As the name it suggests these projects focus on the development of intelligent computer system by imposing human thoughts and intelligence. Many M.TECH students base the projects on artificial intelligence. AI domains that have scope for projects are image representation logical AI, neural networking and common sense knowledge in robotic. Cloud computing projects focuses on effective usage of the resources. Other than this power usage of cloud computing can be minimized and other goal includes service improvements. All prominent issues of cloud computing can be resolved by students of M.TECH on their projects. Issues include that of virtualization, cloud migration, security and complexity and integration. These projects give knowledge on resource sharing, new IT techniques, and analyzing organization capabilities. It is the prior concern in all application. Cloud computing, data mining, streaming video transmission and networking applications all need data security. Both symmetric and asymmetric algorithms are required for M.TECH projects to supply maximum security for data concepts like finger print, iris application and QR code are needed to secure data. Steganography techniques are used by multimedia streaming application in order to encrypt secrete message. M.TECH students do their project on image processing to frame clustering and feature learning modes to classify images. Medical imaging is also part of image processing projects remote sensing images also comes under this category. It is one of the most important parts of artificial intelligence. These projects can access an algorithm that is needed to learn training data, and acquire data clustering the time of learning. Neural network is most needed for industrial process control, mine detection, facial recognition application, sales forecasting, marketing applications and texture analysis process. Networking is the hot spot for M.TECH students to do their projects on. Among all fields of networking students widely prefer wireless sensor network to do projects. These projects minimize data loss, finds lossless path quickly, manages power and maximizes service quality. Agricultural based applications can be developed by M.TECH students for their project. These projects will be of great value for an agriculture based country like that of ours. It also serves as a solution for food starvation issues. We encourage and provide high quality and standardized materials for all the above mentioned projects. Computer Science MTech Projects move to the next level of development.